We have with us Luis Ruiz from Spain for this interview. 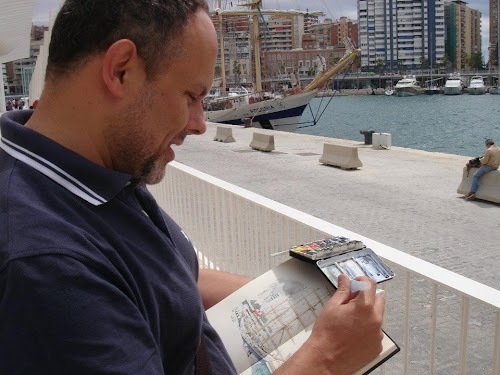 He's an avid sketcher and writes quite a lot on his blog, in Spanish and English. He also blogs for the Urban Sketchers. His sketches provide a wonderful window to the different places in Spain, capturing the urban landscape and atmosphere. They are very dimensional, especially the sketches of town buildings and cities. You can also check out more of his sketches on his Flickr page. 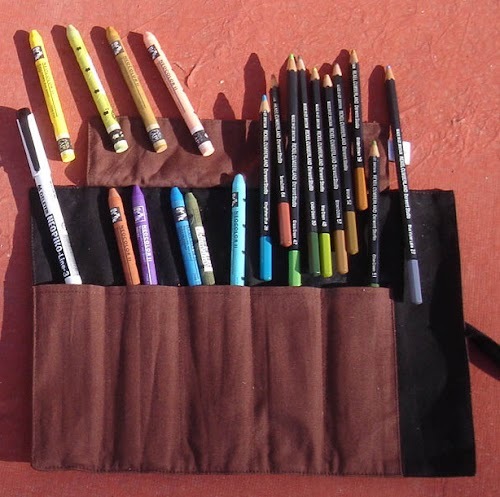 Today he shares with us what he uses for sketching. Qn: Can you give our readers an introduction of yourself? I am an architect working freelance. 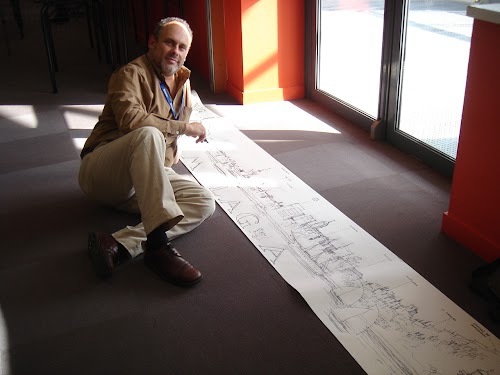 I have also been teaching Landscaping at university for some years and now I am involved in a research study on the evolution and shape of cities from existing old collections of sketches and drawings. I am enjoying this last work very much as I love drawing cities myself! I also do illustration works. I belong to a generation that only started to work with computers at the end of our studies, so I did lots of handmade drawing in my first years at university, including outdoor sketching. I was happy to discover Urban Sketchers many years later. Qn: Let's look at the pencil wrap first. Can you tell us the tools you have there and their characteristics? Looks like colour pencils and crayons? Do you use them together in a same drawing? I do not normally use pencils or crayons alone, except if I am using a sketchbook not suitable for water techniques. I normally use them for putting a stress in some parts of a previously watercolored drawing. The crayons are Caran D’Ache Neocolor II water soluble wax pastels. You can get intense colors with them, what I only use on the paper’s surface locally. The pencils, on the other hand, are Derwent Studio. They are not greasy at all and non-watercolour; and provide light and subtle tones. Both of them belong to big boxes so I only bring with me the ones I think I am going to need. Qn: For the coloured pencil artworks, what do you use to protect the surface? I use pencil in a rather sketchy manner, it is not a careful and soft work of layers, so I do not use any protection on them. Qn: That's a nice pencil wrap. Where did you buy it? Is it leather? Qn: This looks like your watercolour setup. Can you give us a quick rundown of the items shown above? On the left part there is the ink equipment I first use on my drawings: pens and fountain pens, then on the right the watercolour set, brush and waterbrushes. There is also a pack of tissues for cleaning the brushes and a couple of pencils. Qn: You seem to have a lot of drawing tools. Which are your favourites? Definitely, ink pens and watercolour. You can produce loose, quick and clean sketches with them, but at the same time you can suggest detail and give some information on textures, colours and atmosphere. Qn: What watercolour brush is that? The hair looks quite big. Isn't it challenging to work on small areas with that brush? Do you use other brushes? It is a pure squirrel brush. I normally use it on my sketchbooks only for bigger washes, like skies or seawater; but I have to say that you can achieve also thin lines with its tip; it is a very nice tool. The rest of the drawing would be normally colored with water brushes that are much easier to handle when you are standing as you do not need additional water because it is already in the brush’s tank. Qn: What watercolours do you use? I always carry with me a Rembrandt watercolour set in a small and battered tin box. It is only 12x7 cm and has a metal ring to hold it in your thumb, so it is perfect to draw outside. I also like the quality of the colours themselves. 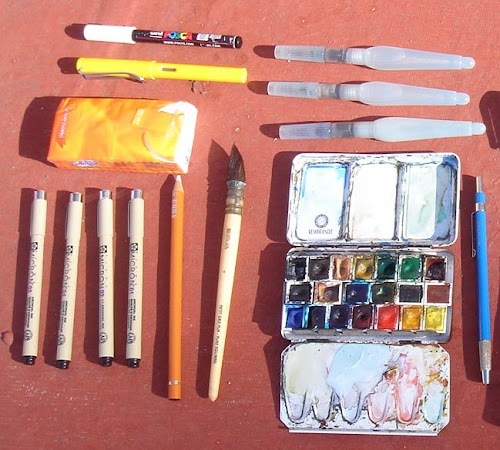 Qn: The watercolour box you use usually holds 12 half pans. What additional colours have you added? Why? Qn: What are some of your favourite colours? Jaune Naples Rouge. I first added it to my box thinking of a flesh colour, but it has become irreplaceable in urban environments and architectural issues. Burnt Sienna. A good companion to the previous one, combined with it in different doses. Turquoise Blue. A touch of it is always perfect for Mediterranean seascapes and skies, mixed with other colours. Cobalt Blue. A basic one. Viridian Emerald Green. I use it for trees but also for the seawater. Qn: Do you clean your watercolour box? I know some artists do while others do not. The colors you usually see in cities are rarely pure. Urban colors are normally “dirty” so it is always useful for me having some puddle remains on the box to mix with in order to get the greyish or brownish tones that usually prevail in cityscapes. Moreover, I am very intuitive doing the mixes… I do not have a mathematical approach as other people I know, that can remember the percentages of each colour they have applied for a particular wash. On that basis, a not-so-clean box is not a problem but an advantage. Qn: What are these pens that you use? What's the difference between them? What I enjoy most is drawing with line, I start straight with ink and afterwards I use colour in an economic form to put the accent only in some places of the drawing. I love textures done with ink and also hatching, and I use pigment waterproof pens for that purpose. I can use different numbers in the same sketch, mainly 0.2 and 0.4. Nowadays I am happy with the Pigma Micron pens I am using, although I have also used Staedtler ones before. For everyday sketches (mainly people sketches) with no colour I use a Lamy Safari fountain pen. 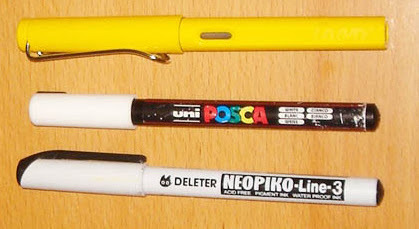 There is also an Uni Posca white ink pen that is useful in some situations for the shines (sea waves, metal details) and a Deleter Neopiko marker with brush tip. Drawing quick portraits with this last one is great fun! Qn: What sketchbooks or watercolour paper do you use? I work mainly on sketchbooks, and Stillman & Birn’s ones are my workhorse since I discovered them. I really appreciate their solid binding that makes them hard enough to stand months of outdoor sketching and traveling. The paper in Alpha and Gamma series, although is not heavy, is of high quality, gets washes very well and I like its touch very much. That lightness makes them also very handy. 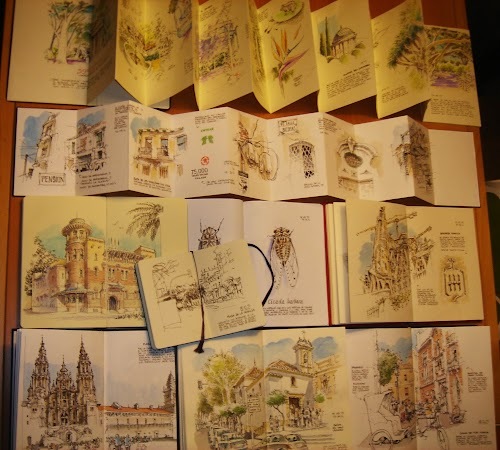 In other cases, like for special events or subjects, I use sketchbooks manufactured in Spain by Choni NaudínM. You can order them custom made and their finishing make them unique pieces. 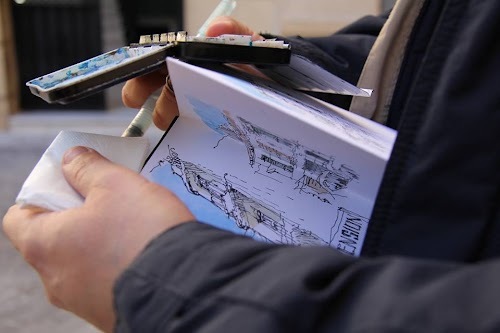 I also use small Moleskines for quick situations; you can keep them in your pocket and draw on them with your Lamy pen when, let’s say, you are waiting for the bus. Qn: There's a very long piece of paper in the picture above. What's that? It is an accordion or Japanese sketchbook. It is the kind of book I was thinking of in the last paragraph of the previous question. As you can unfold it and see all the content in just one sight, it is a good choice in my opinion when the subject is an homogeneous one; you can go on linking one sketch with the following one as you draw, without taking into account what the limits of the page is. In this case, it describes a series of visits to the botanic gardens in my city. It is a nice memory from the experience and you can show the whole of it at once. Qn: It seems that most of your sketchbooks are portrait oriented. Why do you prefer that format over landscape format? At the beginning I used landscape sketchbooks, but later I found that portrait oriented ones are much more versatile and better suited for the narrative character I like to give to my books. In landscape books the drawings are too “isolated” one to the other, while in the other case you have much more possibilities of composing a nice page with different drawings and texts. And, last but not least, they are easier to handle which is important for me as I usually draw while standing. Qn: How long do you typically take to fill a sketchbook? How many sketchbooks have you used so far? Are they sorted by any category, such as by places or date? There are some books running at the same time, as each one has a different purpose. I have a regular chronological sketchbook with city sketches. It is typically a Stillman & Birn that contains 62 spreads, and usually last some months to be finished. At the same time, I have an everyday small book, just for ink, where I do quick sketches in the waiting time, usually people in them. Then I use other books – like the accordions- for special events or sketchcrawls, and then I sometimes might finish them in one day. Qn: Do you sketch and colour while standing up? Isn't that very difficult? I really appreciate the freedom of choosing a vantage point even where there is no room for setting a portable chair. I like sketching in crowded places, and in them looking above parked cars, or having the chance to move a bit if something or somebody suddenly blocks your view, is definitely not a minor point. The condition is having a light gear and avoiding too big sketchbooks, the rest is just a matter of balance. I have a side pack hanging from my shoulder containing everything I need. Qn: Who else do you think we should feature for the interview? Why? I have always been interested in Rolf Schroeter’s work. I love his drawings but I am also very interested in his creative way of mixing different media, and I would definitely love to learn more about his way of choosing materials and tools.